After Alan Lomax returned from his famed 1954-1955 recording sojourn through Italy, he saved some of the highest praise for a particular type of singing from the coastal region of Liguria and the port city of Genoa: trallalero. Anyone who has heard Lomax’s recordings will understand why, as they are a standout in his entire vast catalog. In the notes to the essential, expanded edition of Lomax’s trallalero recordings on CD, Italian Treasury: The Trallaleri of Genoa on Rounder (sadly out of print), Lomax is quoted as saying: I was literally blown away. […] I have discovered that this Ligurian style is probably one phase of music that is literally as old as human time. Yet, it was certainly recorded, decades earlier, on gramophone records. Traditionally, trallalero is sung by nine men, with five vocal parts, though there can be anywhere from 7-15 members in some groups, and more recent trallalero groups employ women. In the nine-man version, five of the voices are bass, or the bassi, which give a drone-like quality to the chorus. A tenor leads the group, followed by the most startling aspect of the trallalero sound, the sharp, high falsetto, sometimes known as “la donna” (the woman), according to Lomax. After the falsetto, there is the “chitarra” singer, who imitates the sound of a guitar, often singing into the backs of his fingers, for lack of a better description. Finally, there is a baritone. The name of the music is based on the syllables “tra-la-la,” which is often used in trallalero songs during vocal improvisations. The nine men stand in a circle. This is certainly for the purpose of eye contact, but again according to Balma, may have its origins with drinking songs sung around tables. It adds a visual element that cannot be captured by recordings alone. In fact, early recordings cannot possibly capture the magic of live trallalero singing, unfortunately. Massive bass drones sung by longshoremen, a piercing falsetto, men singing into their hands, standing in a circle, all singing counterpoint-heavy music with each other…it practically sounds fictional. According to Balma and Edward Neill, the first trallalero recordings were made as late as 1928. That year, the Gramophone Company (and perhaps Pathé) recorded discs by the Squadra di Bel Canto Genova Quarto. In 1930, GramCo also recorded 6 discs by the Squadra di Canto Popolare Isola del Cantone. Meanwhile, Italian’s Odeon branch recorded the Squadra di Canto Popolare Genova Molassana. Some of these groups recorded for other labels, such as Excelsius. Apparently there were around 100 trallalero recordings made during the 78 rpm era. They are almost all incredibly difficult to find – I’ve seen about 6 in my life. Complicating things a little, not all of these tracks by these “squadre” were traditional trallalero tunes. Some of the groups recorded comic songs and tangos, and some songs had modern lyrics, even nationalist ones. Some tracks contained modern stanzas arranged in the old, folkloric style (even Lomax’s recordings contained a version of Glenn Miller’s “In the Mood”). This situation muddies the waters and likely makes ethnomusicologists shake their heads. At any rate, this track, while it is not in perfect condition, I hope retains the original trallalero sound. It was recorded ca. December 1930 in Milan by the Squadra Nuova Sturla, who apparently formed in 1926. This recording was made under the auspices, it seems, of a man named Costanzo Carbone (1884-1955). Carbone was a journalist, playwright, and a lover of Genoan tradition. Several books about him exist, including one co-written by the aforementioned ethnomusicologist and trallalero expert Mauro Balma. If you’ve made it this far and have NOT heard the first track from Lomax’s trallalero collection, let me introduce you to a work of brilliance here. And for a terrific, fly-on-the-wall performance by a contemporary trallalero group that I like, click here. The only other early trallalero performance on an available CD that I know of is – of course – on the Secret Museum series, Volume 3, Track 4. Thanks to Mike Kieffer and Bill Dean-Myatt. Great stuff — the ‘size’ of the sound is impressive, even on 78. The Lomax Italian recordings are a brilliant record of their time, in Italy + elsewhere. Many thanks! This is really great! I had only ever heard the Lomax “La Partenza” before this. Thanks. Great Post! Thanks once again for blowing us all away, Jonathan! For any interested, there is an example of trallalero on the excellent folkways album “In Mezz’una Strada Trovai una Pianta di Rosa: Italian Folk Music Collected in New York and New Jersey, Vol. 1” along with some other REALLY interesting field recordings of other Italian folk music (though it should be mentioned that the musicians on that trallalero recording, despite the album title, were not Italian Americans). A bunch of trallalero on Youtube too! Thank you Will for the info and tips, and Frank Jive and John B for the kind words! I’ve never heard anything like this before. Mind-blowing. 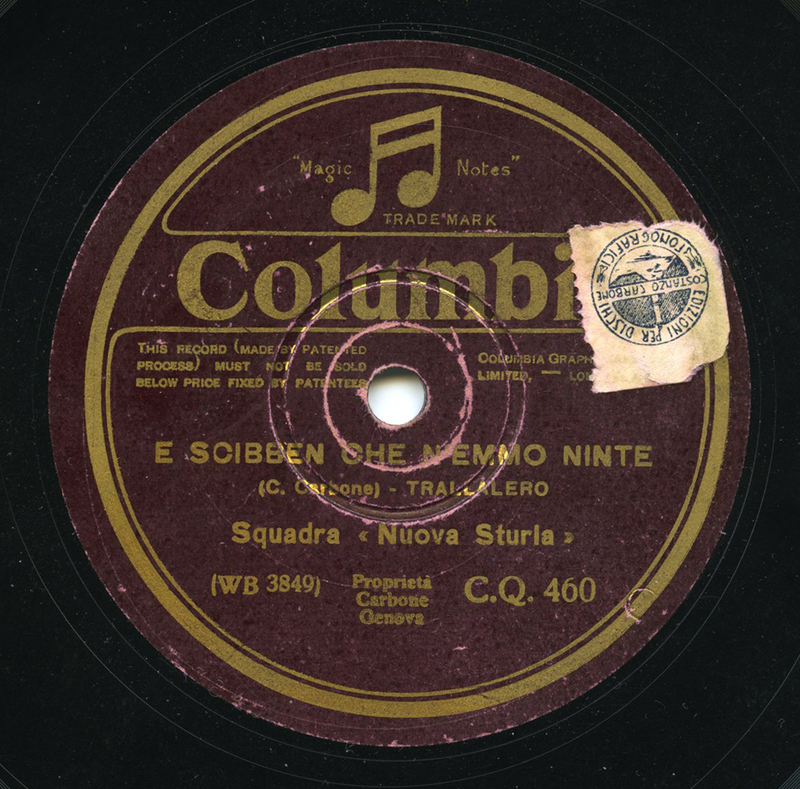 It is the album recorded in 1930 by Squadra di Belcanto Nuova Quarto of Genoa.. My father was a singer of this group, and he received a set of discs at the end of recording. Actual quality of discs is not good, some are in discrete conditions, most populars in bad conditions. The sound was really incredible. That’s really great – thank you so much for sharing!